Encouraging the community use of school premises is a key part of the Government’s Extended Schools initiative. As a result schools, now more than ever, are opening their doors to the general public -whether it’s by hosting out of hours events, holiday activities, hiring out rooms or allowing people to use their facilities. While this provides many benefits, including improved community cohesion and increased revenue, it also presents a need for added security to keep staff (potentially working alone), pupils and visitors safe. Security technology has come a long way since the days of the crackly walkie talkie and there is now a whole host of technology based tools that can be used to support your health, safety and risk management procedures. Did you know for instance that there is technology out there that can track staff, call the police at the touch of a button, identify the location of a fire on the premises and enable you to group call, text and email staff – all through a small handheld device?? And what is this small hand-held device I hear you cry! It is a two-way radio. And, before you stop reading this as your eyes glace to your mobile phone, two way radios offer a whole host of security benefits a mobile phone can’t – operating even when there is no phone signal! This is ideal for caretakers, security staff or teachers working late. According to the Office of National Statistics there are four million lone workers in the UK, and about 160 lone workers get attacked every day! The lone worker feature requires the radio user to press a button (on the side of the radio) at pre-determined intervals. If the worker does not check in at the expected time – an emergency procedure is set in motion. If during their duties an employee feels vulnerable, threatened or under attack; they can immediately press their Panic Button. 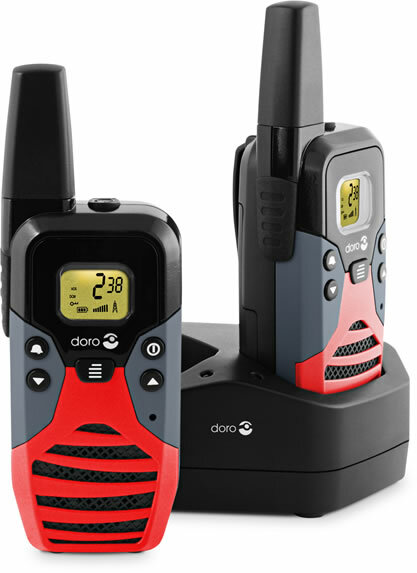 Easily identifiable on their two-way radio – this allows them to quickly call for help. The Panic Button automatically dispatches a text message or tone to the person or team responsible for their security. Text message alarms can be picked up by monitoring stations, security guard radios, mobile phones, pagers and even email accounts. This feature instantly notifies staff to the location of alarms and emergency door use. The system alerts the fire group on their radios by dispatching a text message. If the selected team do not acknowledge the call-out; the system notifies back-up personnel in order of priority – escalating the alarm until it’s managed. This means there is less dependency on control room operators to monitor fire alarms, so they can focus on other high-priority activities. This enables users to call 999 at a touch of a button even when there is no mobile signal. The radios can be used like a phone with the added bonus that you avoid the recurring costs of mobile phones, you get better coverage and at a fraction of the cost. Group calling allows users to broadcast an emergency situation to all two-way radios. It also means members of diverse workgroups have the ability to communicate in private with each other. System-wide calls automatically override individual and group calls, ensuring urgent messages reach every radio user at the same time. 6) 100% in-building coverage (which you don’t get with mobile phones!). Tolerating poor coverage means your staff often have to run back and forth between different areas, so they’re able to communicate with colleagues. But worse than that, when calls are missed and messages become garbled, this could potentially be fatal in an emergency. With digital radios, the built-in error correction reconstitutes the voice with virtually no loss of coverage over a greater area. It also reduces background noise by compressing speech and filtering out everything except the human voice. By choosing to have up-to-date technology at your finger tips; you can easily enjoy more consistent audio performance. When staff are on the road, especially working in hazardous or dangerous locations, everyone involved feels more relaxed and secure when you can pin-point their position, using GPS-enabled radios. You have heard about the technology available so now it is worth thinking about how you can make it work for you, your school’s priorities and the health, safety and risk management procedures you already have in place. There are a number of companies out there offering this technology who can talk you through your options and find a solution that fits best with the needs of your school. They can offer onsite support – supplying a qualified member of staff (or a whole team of engineers if required) for the duration of any event – anywhere in the world. To find out more visit www.brentwoodradios.co.uk or telephone 0808 250 8254.